The historic town of Shrewsbury, Shropshire plays host to its 11th international cartoon festival in April, this year themed around “Style”. Cartoonists from around the country will converge on the town’s market square to draw caricatures of passers by, paint gag cartoons on giant boards, demonstrate cartooning techniques and work flat out to entertain visitors with their talent. In addition there’s an exhibition of original cartoons and prints for sale at a local gallery and a cartoon trail around the town. Our Studio Co-ordinator Terry Anderson will be attending this year to conduct a caricature workshop open to (virtually) all ages as part of the festival’s range of events. Free entry but please call 01743 258888 to book a place. 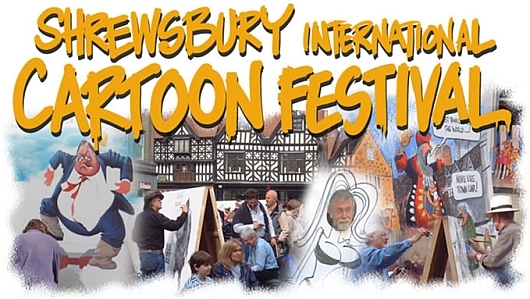 The Shrewsbury International Cartoon Festival is supported by our colleagues at the Professional Cartoonists Organisation.